The report on “An integrated water management strategy for Bengaluru” attempts to visualize the interface between water supply management, waste water management and storm water management (or more broadly water resources management). It endeavours to take a systems approach to managing water. Six initiatives that together form a comprehensive plan to address Bengaluru’s water crisis is also presented. 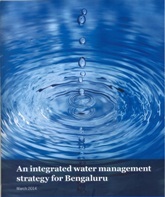 The joint CII-McKinsey India report was released at the CII Karnataka Annual Water Conference under the theme “Urban Water Management” held on 12 March, 2014 at Bengaluru.